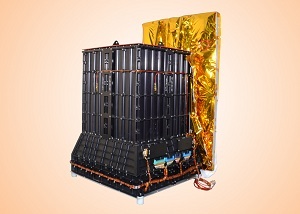 The Cadmium Zinc Telluride (CZT) Imager is the one among the four X-ray instruments on ASTROSAT which cover the broad energy band of X-rays extending from 10 keV to 100 keV. It has a large detection area of about 976 cm2 comprising of the CZT detector modules and using an imaging process known as Coded Aperture Mask (CAM). The CZT detectors provide us with high stopping power, low thermal noise, room-temperature operation and excellent energy and spatial resolution. The Coded Aperture Mask is a method specifically designed for the high energy radiations like X-rays and γ rays due to the impracticality of mirrors and lenses. Copyright © 2015 TIFR, All Rights Reserved.